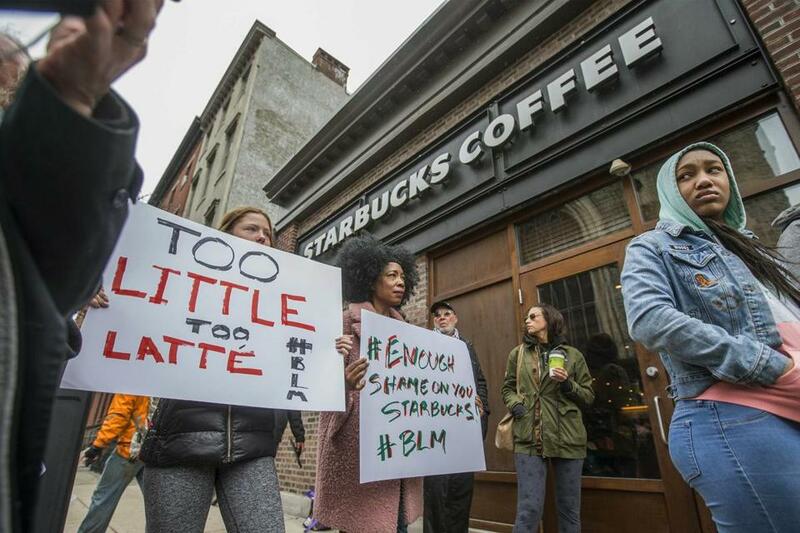 Protests continued Monday at a Philadelphia Starbucks (above). NEW YORK — An employee who called police to the downtown Philadelphia Starbucks where two black men were arrested last week is no longer working there, Starbucks said Monday, as the company’s chief executive apologized for the “reprehensible” episode. “We can confirm that she is no longer at that store,” a spokeswoman said, declining to name the employee or provide details. The chief executive, Kevin R. Johnson, said on ABC’s “Good Morning America” that what happened to the men was “wrong” and that he wanted to meet with them to apologize. “It’s my responsibility to understand what happened and what led to that, and ensure that we fix it,” Johnson said. He said that the company was reviewing its guidelines, which can differ among its 28,000 stores worldwide, and that it would invest in training about unconscious bias. The company instructs employees to call police in certain situations, such as those involving “threats or disturbance,” Johnson said. Johnson made the remarks as demonstrators filled the store, at 18th and Spruce streets, Monday morning. Footage posted on social media showed protesters holding placards and chanting slogans against the company and the police action. On Thursday, the two men asked to use the coffee shop’s restroom. An employee refused the request because the men had not bought anything, officials said. They sat down, and they were eventually asked to leave. When they declined, an employee called police. Some of what happened next was recorded in a video that has been viewed over 10 million times on Twitter and that was described by Johnson as “very hard to watch.” Police surrounded the men and escorted one of them out of the Starbucks in handcuffs. The other soon followed. The men, who have not been identified, were arrested on suspicion of trespassing. But Starbucks did not want to press charges and the men were later released, Police Commissioner Richard Ross Jr. said in a recorded statement Saturday. The prosecutor’s office reviewed the case and declined to charge the men because of “a lack of evidence that a crime was committed,” said Benjamin Waxman, a spokesman. A longer video of the episode shows police talking with the men for at least four minutes before a white man, Andrew Yaffe, joins them. He informs police that the people they were about to take into custody were “not trespassing” and were meeting him there. The episode goes to the heart of how the company has modeled itself, with campaigns that address racial and social issues and promote its image as a community meeting place for customers to linger. In 2015, the company encouraged its baristas to write the words Race Together on coffee cups as a way of promoting discussion and unity. Many were skeptical of the effort, pointing out that Starbucks’ own leadership was predominantly white.